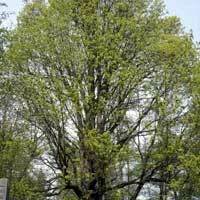 The largest deciduous tree in the native collection, the big leaf maple is king of the northwest woodland. It grows faster than its competing conifers but tends to die sooner, letting the conifers take its place. The leaves are huge and can be up to ten inches wide. Because of its rapid growth, it can be brittle and lose branches if exposed to much wind. The trunk is host to moss and many woodland birds and insects. The leaves provide nourishment for forest floors but can easily smother a lawn. It is well covered by large hanging clusters of blooms in the spring.